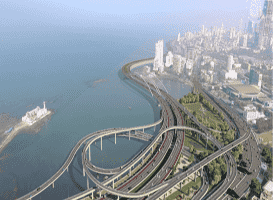 According to a feasibility study, the 29.20-km Mumbai Coastal Road has been planned from the Princess Street flyover to Kandivali with a combination of roads on reclamation, bridges, elevated roads and tunnels along with the construction of a seawall or breakwater in the intertidal zone. The project has been proposed in two parts: the southern part from Princess Street flyover to the south end of Bandra Worli Sea Link (9.98 km) and the northern part from the north end of Bandra Worli Sea Link to Kandivali (19.22 km). The proposed project involves the construction of a combination of land-filled roads (on reclaimed areas), bridge, tunnels, road on stilts over mangrove areas, interchanges, culverts, pedestrian underpasses and foot-over-bridges. On approvals received for the project, Mukherjee adds, “Several NOCs and clearances of from the Centre and state have been sought. We have received most of the clearances and NOCs from Maharashtra Maritime Board, Public Works Department, Indian Navy, Coastguard, Harbour Engineer, Mumbai Heritage Committee, Fisheries Department and the High Power Committee, for example.” The proposal for the southern part of the Coastal Road for CRZ clearance has been recommended by the Maharashtra Coastal Zone Management Authority (MCZMA) to the Ministry of Environment And Forest (MoEF), and has been considered positively on its merits by the Government of India.